The State Theatre in Zumbrota Classic Movie Sundays Continue! The Historic State Theatre in Zumbrota invites everyone to step back in time to cinema’s Golden Age with Classic Movie Sundays. 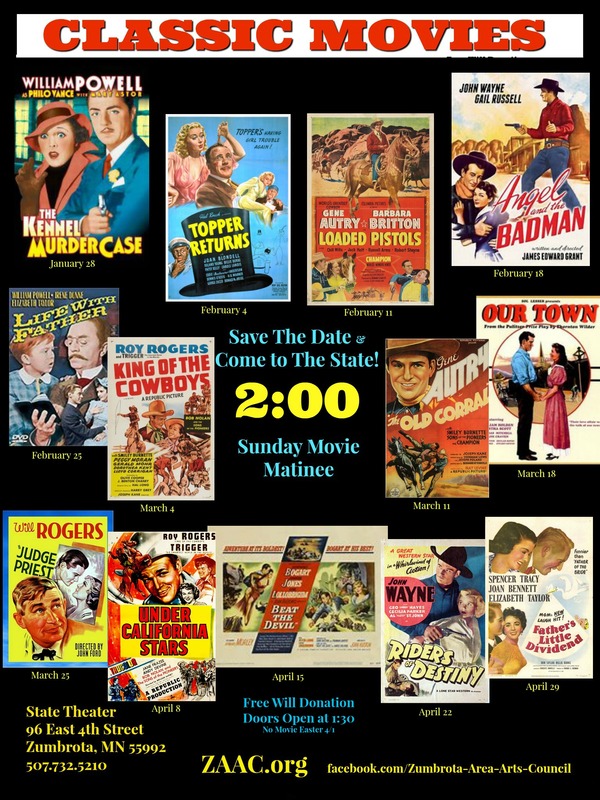 The State will feature a different movie almost every Sunday at 2:00 pm. While admission to the films is free, free will donations are encouraged and gladly accepted, with all proceeds from Classic Movie Sundays funding continued restoration and operation of the Historic State Theatre building. All of the movies will be shown in their original, unedited format, with a pre-show news reel or cartoon from the same era. Concessions will also be available for purchase at these shows. The movies are sponsored by individuals, businesses and by ZAAC. Originally built in 1921, The State Theatre has hosted movies and vaudeville acts for 95 years. The Zumbrota Area Arts Council purchased the building in 2011, and hosts movies, concerts, live theatre, and educational events in the facility. Renovations have been ongoing since 2013, when supporters of The State began the Encore Campaign to raise the funds needed to restore the building and make it accessible to a 21st century audience by adding handicapped accessible bathrooms, a new concession area, and improving the lobby area. Plans for the next renovation phase include additional restoration work and stage improvements. The Historic State Theatre is a community based, non-profit organization. As part of the Zumbrota Area Arts Council, its mission is to inspire participation in the arts and cultural experiences to enrich and expand Zumbrota’s community life. A complete list of events and Classic Movie Sunday details can be found at www.ZumbrotaStateTheatre.org. Programming is made possible by the voters of Minnesota through a grant from the Southeastern Minnesota Arts Council thanks to a legislative appropriation from the arts and cultural heritage fund.